Unfortunately, we don't all lead the life styles we would like so if you have a poor diet, suffer from stress, have to cope with excess pollution, are ageing or take medication your body may need a little help. Glutathione—called nature’s “master antioxidant”—is a powerful defender against these attackers and is essential for good immune health. But the constant barrage depletes glutathione levels, lessening your body’s ability to fight back*. Each two-capsule serving also includes milk thistle extract—known to support healthy liver functions—green tea extract and selenium, both antioxidants that protect the body from oxidative stress. 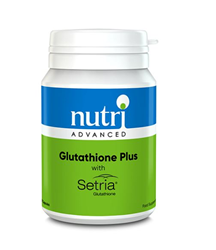 Glutathione Plus also contains alpha lipoic acid, which helps regenerate other antioxidants, including glutathione and vitamin C.
Nutri Advanced Glutathione Plus is now available for health professionals and consumers in the United Kingdom and Ireland. Visit nutriadvanced.co.uk for additional release information. Nutri Advanced are a leading nutritional supplements company, the number 1 choice for practitioners in the UK. In 1981, naturopath Norman Eddie and his son Ken established their family business and set out to raise awareness among health professionals about the benefits of nutritional supplements. As word of mouth spread, the natural health industry developed and Nutri Advanced began to win the trust of practitioners across the country. Nutri Advanced, now headed by Ken Eddie, has been challenging the conventions of mainstream medicine, offering cutting edge supplements and providing an unrivalled level of customer support for over 35 years, positioning itself as a pioneer in the nutrition field. For more information, visit nutriadvanced.co.uk. Setria® Glutathione, manufactured by Kyowa Hakko Bio Co., Ltd., is a clinically studied and patented form of glutathione that, when taken orally1, has been shown to replenish the body's reserves, which may be depleted as a result of poor lifestyle choices, stress or natural aging. Called the "master antioxidant," glutathione helps protect cells in the body from the damaging effects of oxidative stress and toxins. Setria® Glutathione is manufactured through a patented fermentation process to yield high purity and high quality, is vegetarian and allergen-free. For more information about Setria® Glutathione, visit SetriaGlutathione.com. Kyowa Hakko Europe and Kyowa Hakko Bio Italia are the Central-North and South European sales office for Kyowa Hakko Bio Co. Ltd., an international health ingredients manufacturer and world leader in the development, manufacturing and marketing of pharmaceuticals, nutraceuticals and food products. For more information, visit kyowa.eu.